Anyone else super excited for Halloween? Not only are there fun events surrounding the day, the options for Halloween clothing and accessories grows bigger every year! I've dedicated this month's installment to some of my favorite places for spooky goodies. Mischief Made Me might provide their customers with spooky goodies year round, but I had to include them because everything is just so cute! 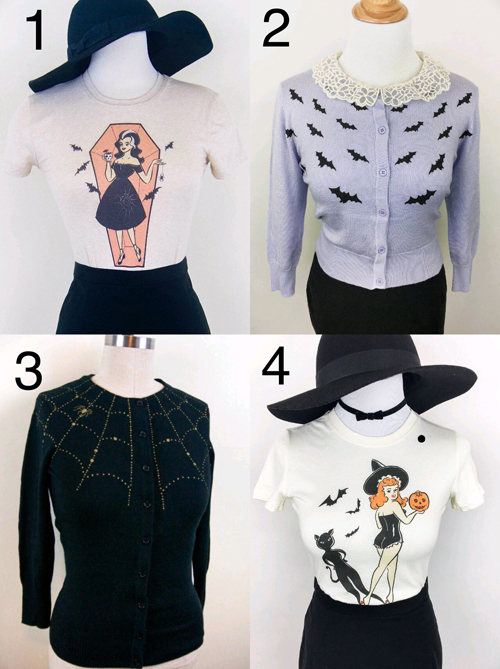 I've been dying for a spiderweb cardigan for ages and I love the new Trick or Treat t-shirt. They're currently on pre-order so I'm going to snag one before they're all gone! Poison of Choice has such great Halloween goodies this year. 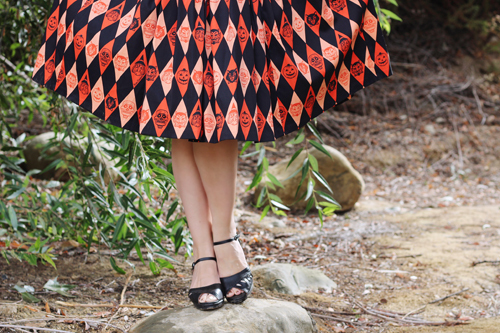 I love the orange and black version of the poison apple brooch and their harlequin brooch would be the perfect match for my Vixen Trick R Treat skirt. My cart is currently full of their festive jewelry, I can't seem to slim down my choices! Thought that Target was only good for Halloween home decor? They've totally stepped up their game this year! 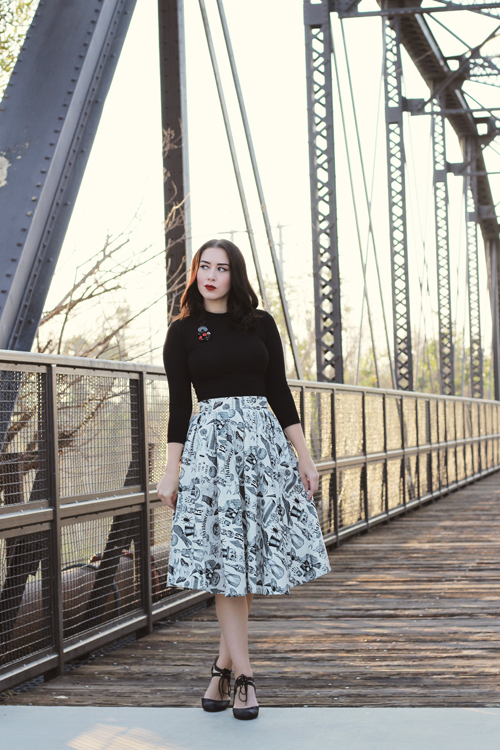 I love the novelty print dresses (they're currently on sale!) and the glow in the dark shirts are perfect for a spooky night out. I might need all four of these, just sayin'. 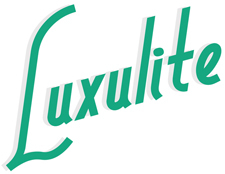 Luxulite is forever my favorite. Katy's Halloween collection this year is amazing and I can't get enough of these fun colors! 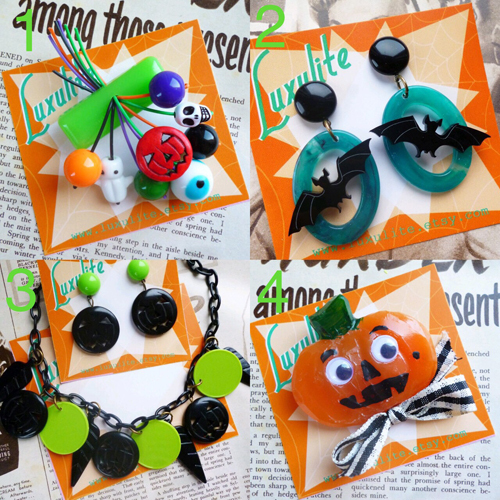 I love that she offers matching earrings to her necklaces, just in case you really want to show your spooky spirit. 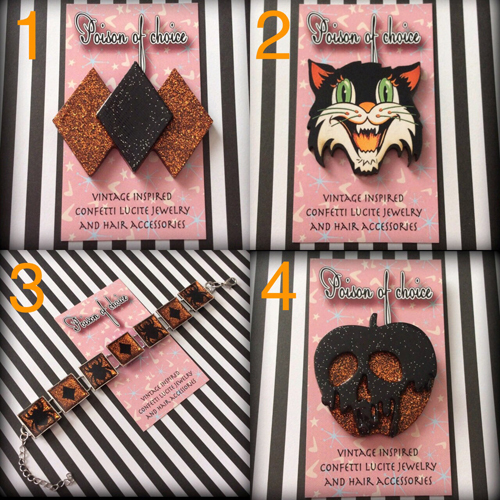 Where are your favorite place to shop for Halloween swag? Let me know in the comments below! It's true: I'm a sucker for Trashy Diva's Streetcar dress. While this dress isn't a new style (although they did make changes to this one), it had been quite elusive until they re-released it over the summer. I've been campaigning for the Streetcar's return so you can guarantee that I add every single one to my closet! The new Midnight in Paris collection is this year's Tourist Print and I couldn't be more smitten with the classic, vintage look and feel of it. The Midnight in Paris Streetcar dress features a mandarin collar with attached neck ties. 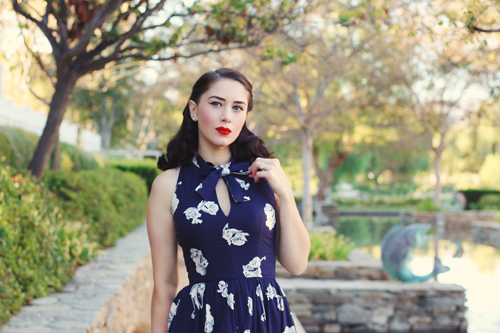 When tied, the neckline turns into a sultry keyhole with a classic bow at the top. All the older Streetcar dresses feature a loose, much bigger necktie that covers the keyhole detail. This shorter tie feels daintier and allows the design to really shine. While I don't usually like to show skin around my bust line, this doesn't feel risque to me at all. The light, gathered skirt has two hidden side pockets and the side zippered closure is much easier to get in and out of than most my other Streetcars. The Midnight in Paris collection is made from a soft and buttery stretch rayon that allows you to size down if you're in between sizes. I'm usually between a 2 and 4 in Trashy Diva (and almost always a 4 in this style) but I easily took a 2. I can't wait to wear this dress to every possible occasion, I love it so much! This weekend I'm meeting up with a good friend to go to a fancy Hollywood blogger event. I haven't been out in awhile, I haven't seen my friend in awhile, and I haven't attended a blogger event in awhile, so I figure I should kill three birds with one stone. I'm excited to push myself out of the house, considering this week was so traumatic for me with the loss of Rocco. I'm sure I'll be posting a lot of it on my Instagram if you'd like to follow. I haven't picked my outfit yet but I feel like this dress might be the winner! I know this isn't the norm here but: I'm definitely wearing pants. While my collection isn't very large, I was happy to welcome these Voodoo Vixen trousers to the group. Super light and perfect for fall, I couldn't wait to style these for my blog! To get all the info on this outfit (including fit advice), keep reading below! Made from a soft poly blend, these trousers feature a high waist rise, elastic back waistband, wide leg, and side pockets with decorative buttons. 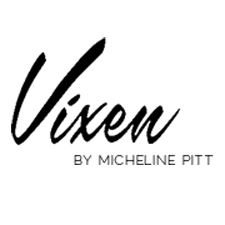 In my opinion, Voodoo Vixen usually runs large for me so I took a size XS. Because of the relaxed fit, my hips easily fit into them. I paired these trousers with the new Celine top in black. 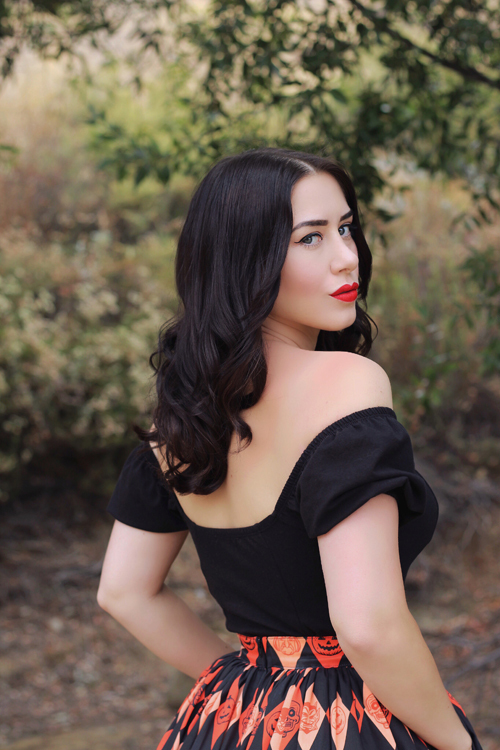 This Miss Victory Violet/Voodoo Vixen collaborative top features a slight cowl neckline, button detail at the shoulder and sleeves, and a keyhole opening in the back. I took a size S and it was a perfect fit! I really love this outfit and I can't wait to mix and match these pieces for fall. I guess there's no "right" way to say it but I had to put down one of my dogs yesterday. My favorite dog, Rocco. He was my world but he's been sick for some time and I knew this day was coming. I'm still kind of shocked and numbed over this whole thing, but more than anything I'm heartbroken. I'm trying to push through and distract myself, but this has been really hard for me. I'm going to try to keep myself busy by blogging, but if I go silent, you'll know why. Keep me and my family in your thoughts please, we could really use it right now. 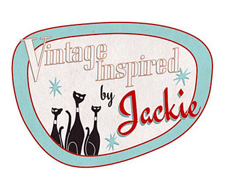 I'm forever impressed with Vintage Inspired by Jackie's creations. 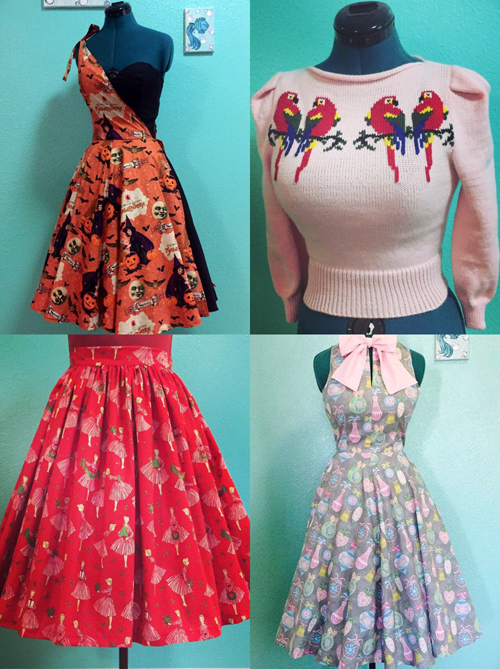 Commonly referred to as my dream dress fairy, Jackie is an expert at turning your childhood favorites into wearable treasures. 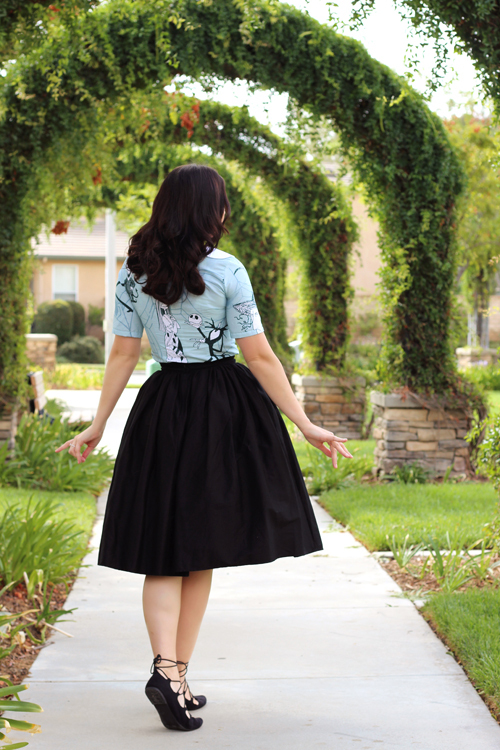 When she released this Nightmare Before Christmas Peter Pan collar blouse I knew I needed it on my body! As always, her work is impeccable and did not disappoint. While this is perfect for the spooky season upon us, I can see myself wearing this all year around! Made from vintage bed sheets, this exclusive piece features a white contrasting Peter Pan collar, half sleeves, and a side zippered closure. As always, Jackie makes sure the print placement is perfect. 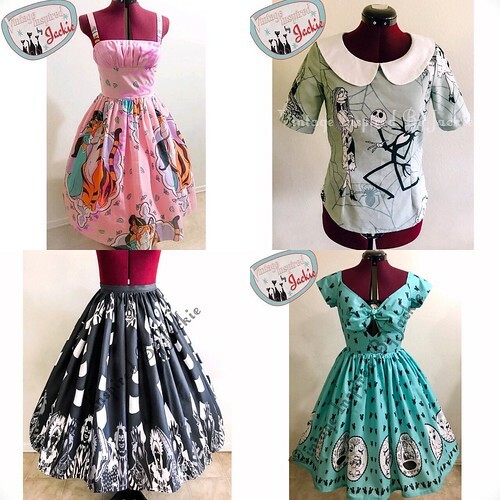 I love how Jack and Sally are front and center on the front and back! Initially the sleeves were a little tight when I first tried it on (my arms are big for my body), but it definitely eased with wear. If you're interested in this exact top, I wouldn't hesitate. From what I understand, she has a limited amount of this fabric. And if Jack Skellington isn't your thing, she's always open to making something custom for you. I've had lots of crazy ideas and she somehow makes them all come true! This week I'm gearing up for some Halloween time at Disney, doing a little work, and dusting off the holiday home decor box in the garage. I'm ready to fill my house with pumpkins, ghosts, and vintage decorations! My husband thinks it's way too early to start decorating, but I've been itching to do it since the beginning of the month! Anyone else crazy about Halloween like me? I hope you are because I have lots of spooky posts ready for the next several weeks! I feel like I'm in this limbo where everyone in the northern hemisphere is preparing for fall weather... Except me. I love cozy cardigans, layering, and feeling the crisp air of autumn, yet I won't be participating in any of those things for at least another month. This Arana dress from Stop Staring is the perfect way to dress for this lingering summer but showcase a beautiful fall floral print. Finding ways to extend your wardrobe through seasons can be hard, but Stop Staring makes that task so much easier! The Arana swing dress is made from a stretchy but structured cotton and features a gathered crossover bust, sweetheart neckline, three strap detail, full gathered skirt, and a back zippered closure. While the straps are not adjustable, they definitely accommodate someone with a longer torso like myself. I went with my usual size small in Stop Staring dresses and it was a very comfortable fit. The Arana is definitely one of my favorite styles they offer and I hope to see this swing dress in other prints in the near future! Well, it's official: I finally found Bianca the perfect daycare! While she will only be going once a week, that's one day I'll get for "adulting" and one day she'll get to spend with kids her age. Sometimes I feel slightly guilty that she's going to be an only child, so having her interact with other kids on a regular basis kind of feels like a compromise. Her first day is next week, so here's to hoping she enjoys it as much as I think she will! I do my best to shop small because it's important to support more budding businesses and less major ones. Throughout the years, I've found some wonderful shops with gorgeous products for your everyday needs. Today I'm sharing my favorites and I hope you love them as much as I do! 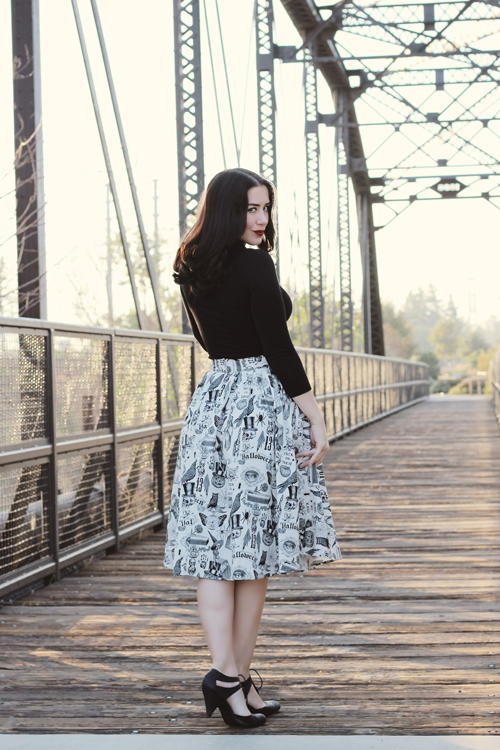 Ebone is a sweet and ridiculously talented dress maker. Tailored to the ultra-femme and Disney-obsessed (have you seen that Toy Story dress?! 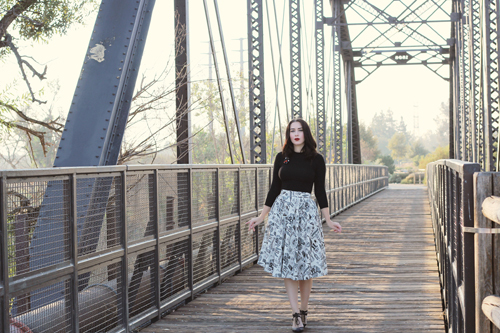 ), her skirts and dresses are perfect for a day at the park or for some everyday sweetness. I've already ordered a few of her creations and I can't wait to have a closet full of her dresses (pending infinite income, of course). She's always open to tweaks on her dresses and she's also willing to make garments to your actual measurements. I've enjoyed every minute of my communications with her and I'm very proud to be one of her customers. Talk about ultimate fandom jewelry! 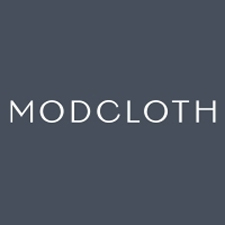 This amazing Australian-based shop features fun and quirky pieces for your everyday needs. 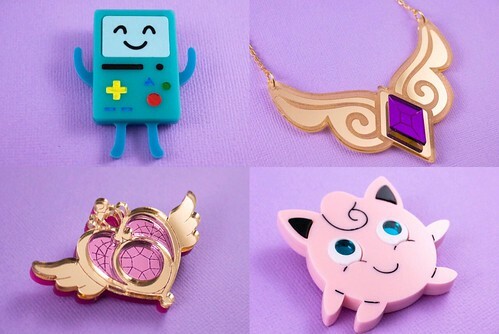 Featuring Sailor Moon, My Little Pony, Adventure Time, Pokemon, and more; these pieces are ridiculously cute and very reasonably priced. I'm having a hard time picking what I want without going too crazy! Alixis, the wonderful woman behind Ains & Elke StyleHaus, is obviously incredibly talented. 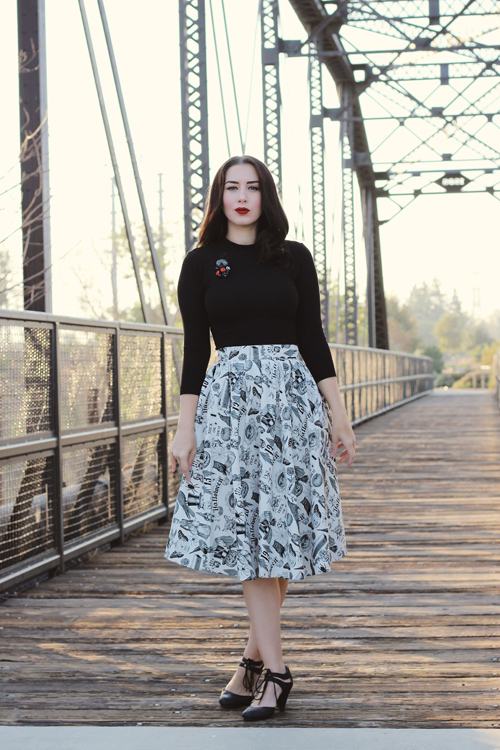 While she features a lot of dresses and skirts, she also has incredible knit sweaters, menswear, and children's clothing. If you don't see the exact piece you're looking for, she's ready and willing to do something completely custom for you. From one mom to another, I have lots of respect and admiration for her! While Besame has made some big moves this year, it's still very much a small business. Known for their attention to vintage detail, Besame enhances your beauty with cruelty-free products and comes in the most gorgeous packaging. 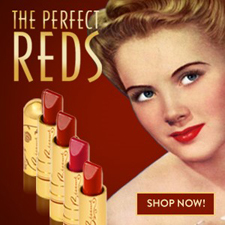 I wear Besame every single day and I cannot wait for their Snow White and Agent Carter products to release! 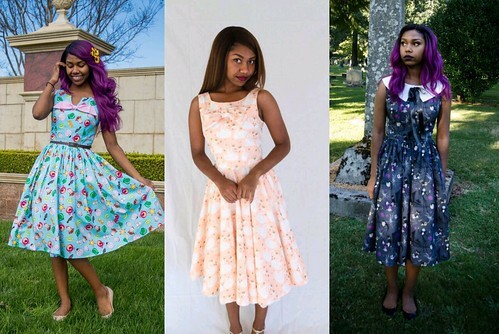 Known for her attention to detail and her vintage bed sheet dresses, Jackie is the queen of all things cute (and creepy)! She's collaborated with a few very talented and fun artists to create one-of-a-kind pieces that have me swooning! It's a rare day when I'm not wearing one of Jackie's creations to Disneyland and I'm sure you can see why. I can't wait to debut a very special set she's made for me over at Disney California Adventure... Stay tuned! 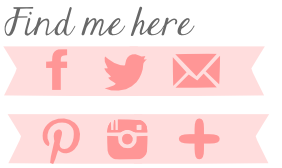 My lovely friend Lisa is the woman behind Color Theory Shop and she has so many cute goodies in there! 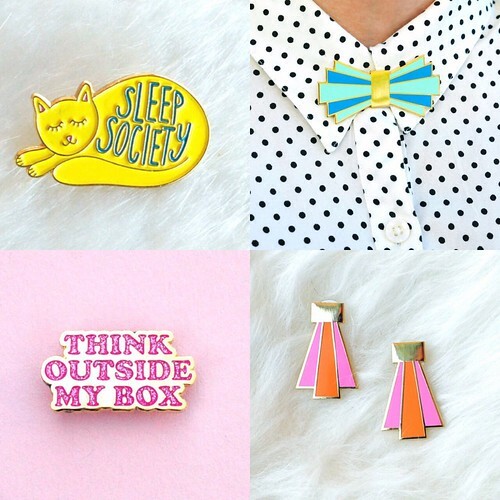 From cute and witty enamel pins, lady ties, patches, and vintage clothing and shoes; you're bound to find something you need to add to your shopping cart. You can also get free US shipping on orders over $40 with the code "FREESHIP"! What are your favorite small businesses to shop from? Let me know in the comments below!